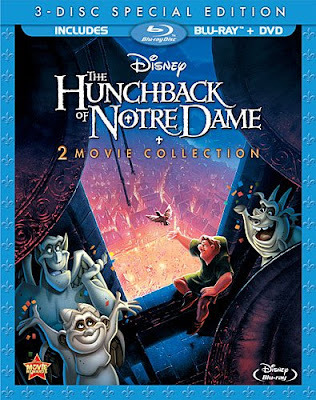 Rediscover the majestic musical adventure of The Hunchback Of Notre Dame and The Hunchback Of Notre Dame II - together for the first time in stunning Blu-ray high definition. Bring your family together for the extraordinary tale of Quasimodo in a soaring celebration of the beauty inside all of us! Join the world's most unlikely hero as he meets his first real friend, Esmeralda, while fighting to save the people and city he loves. The legendary story continues as Quasi reunites with his gargoyle friends to protect the cathedral's most famous bell and find true love. The Hunchback Of Notre Dame soars with a magnificent score by renowned composer Alan Menken (Beauty And The Beast, Aladdin). Enjoy both magical films, bursting with brilliant animation and unforgettable characters, together on Disney Blu-ray. Oh boy do I remember watching The Hunchback of Notre Dame. years ago It was such a great movie that inspired lots of kids. When I got to watch it again with my kids I got asked a lot of questions as to why Quasimodo was kept away from everyone. They were pretty sad about the reason why he was locked away, but they got super happy when he was able to get out and explore on his adventure. I loved the music. The music in both part one and two is something that drew me in. Disney music is the best. As for part two, it was good, but honestly there is nothing like part one. The kids enjoyed both and it made for a great movie night that came with a lesson to never judge anyone by the way they look. Disclosure: All opinions are my own. I received The Hunchback of Notre Dame 1 & 2 at no cost for the purpose of this review. No other compensation was received.